BAMA PULISMART is a liquid product that has a degreasing, decontaminating and deoxidizing action on stainless steel. 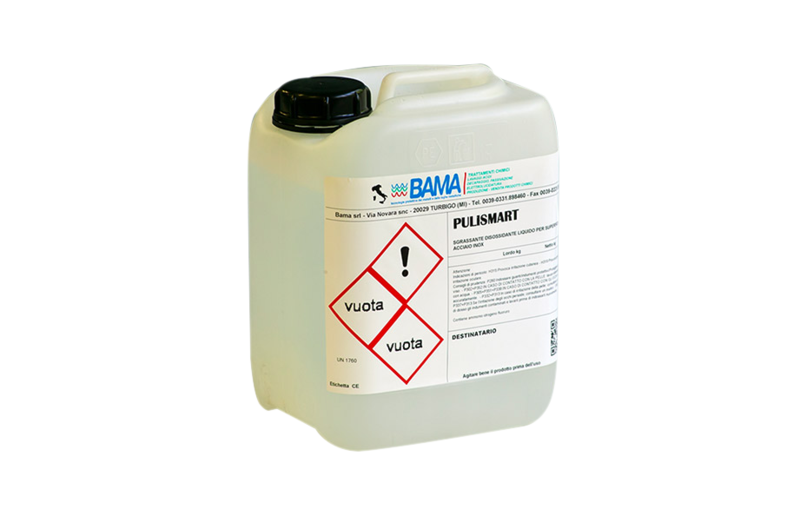 BAMA PULISMART is recommended as a pre-treatment before pickling and passivation. The product is characterized by a strong cleansing and degreasing action that eliminates slight oxidations, salts and residues of grease and greasiness from the surface of the metal. BAMA PULISMART must be carefully shaken before each use. BAMA PULISMART can be applied: by spraying on the metal surface using a cloth soaked on the area to be treated by immersion of the product in the solution. The product can be used at different concentrations, using water as diluent. The concentration to be used depends on the degreasing and deoxidizing power required to clean the metal surface. The reaction times of the product range from a few seconds to a few minutes and depend on the type of stainless steel, the operating temperature and the extent of contamination. BAMA PULISMART is available for sale in 5kg tanks (sales code: PS5) 10kg (sales code: PS10), 25kg (sales code: PS25). When applying the product, acid-resistant eyewear, gloves and overalls must be worn. For further information on the hazard classification of the product, please refer to the relevant safety data sheet. BAMA PULISMART must be stored in a place protected from high temperatures and direct sunlight. The product must be stored in canisters specially supplied by BAMA and labelled in accordance with EEC regulations. Washdowns must be sent to a suitable wastewater treatment plant or recovered by specialised companies.